Facebook has finally started working on standalone instant messenger (IM) software to allow users to chat with Facebook friends without using Facebook website. While we have already seen ways to Facebook chat without Facebook website in the form of apps like Facebook chit chat and Pidgin, Facebook Messenger is official IM program from Facebook (which sadly do not have many features to boast about). 1. Chat and messages between you and your friends on Facebook. 2. View latest status updates of your friends as displayed in ticker. 3. Get instant notification about latest on Facebook. Please note: Facebook Messenger is in test phase and all future updates will be installed automatically. Following is a quick procedure to get going with download, install and usage of Facebook Messenger IM software on your Windows 7, Vista and XP computer (no news on Mac version!). [Originally Published on Dec 30, 2011] Updated on March 07, 2012 when Facebook officially made available the ‘Facebook Messenger software for download. 1. First we need to download Facebook Messenger software (now official available for download). Download link is hidden in Facebook help center and it not yet publicised widely on Facebook. Once you download, launch the setup file to complete installation. 2. 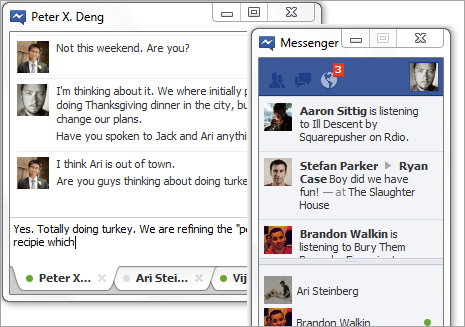 After install is complete, you should see Facebook Messenger icon on the taskbar and IM window on the screen. Clicking Login button will launch Facebook website in your default web browser. Click Facebook icon on Windows system tray and then enter your Facebook login details to finally login into messenger program. 3. Top part show 3 keys buttons for: friend requests, messages and notifications. Your offline and online Facebook contacts are displayed in the messenger window. You can click either friend contact and start chatting. If specific friend is offline, then chat window may display your recent (past) chat messages with that friend. 4. Tricky part is the logout procedure as there is no logout button on Messenger software. To logout from Facebook messenger you need to logout from Facebook account by opening Facebook website in your web browser (crazy, isn’t it?). Facebook has fixed this in new release. To logout, right click Facebook icon on Windows system tray and then click Log out button. Also, when you log out of the app, you will still be able to view your content on facebook.com. 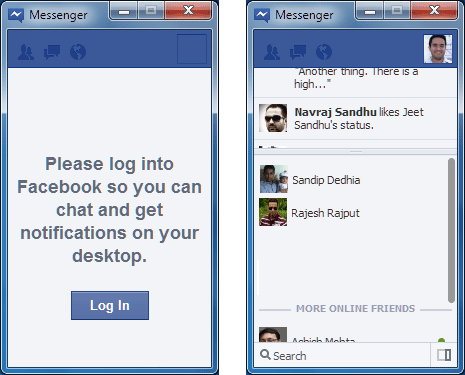 Logging out of the app will not interrupt you from viewing an active Facebook session on your browser.